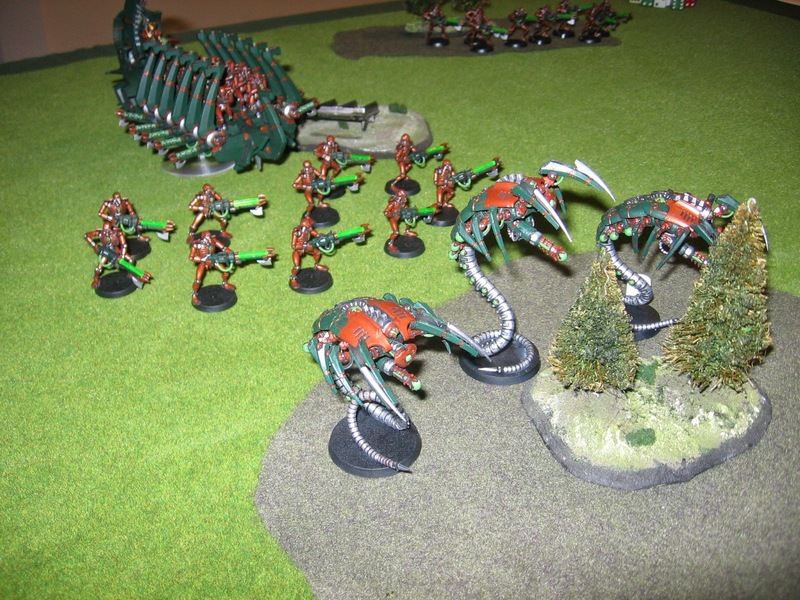 Adrian introduced me to Warhammer 40K 12 years ago. The 'interest' at the time was fuelled by the desire to be able to understand the game that the boys at my College were playing when I first began teaching there. 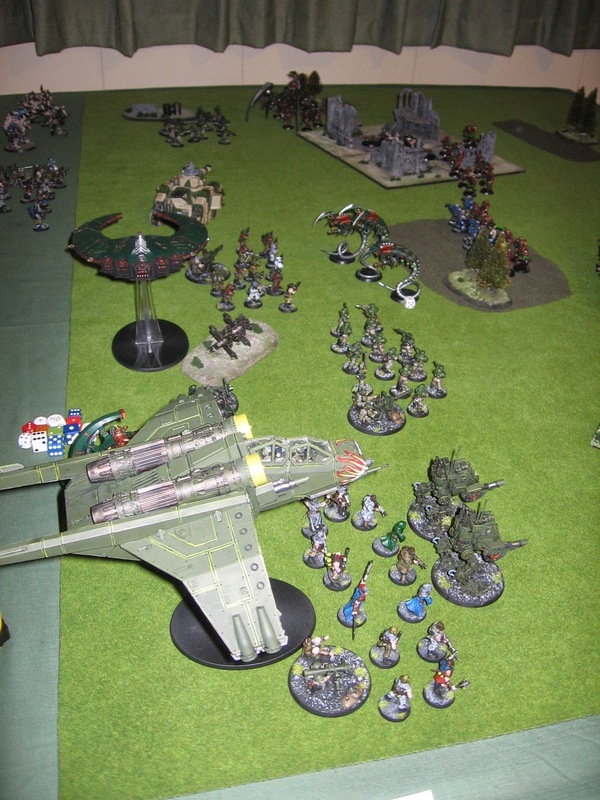 40K 3rd edition was the thing, but the game 'evolved' so that it is currently in its 6th edition amendment phase. 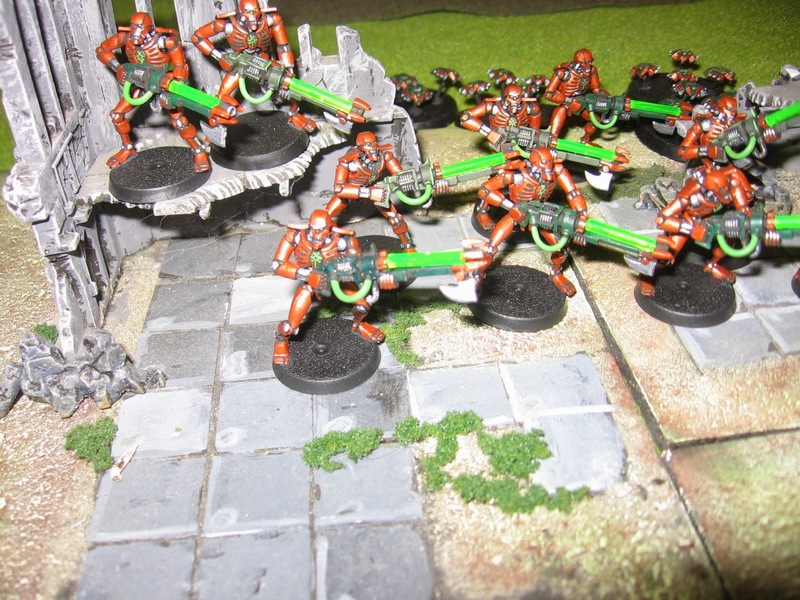 I enjoy painting the GW miniatures, and they look great on the table, but frankly rules creep fatigue set in early. 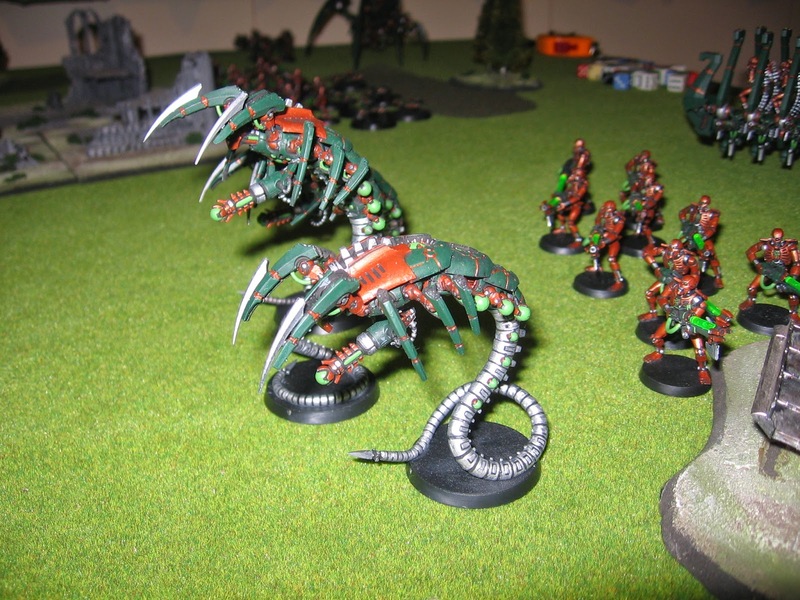 We don't play the game often enough to keep up with the endless rules and codex changes. Our wallets also tire of the endless outlay in ever more expensive rule books. Generally our only game opponents are each other, and occasionally Andy. 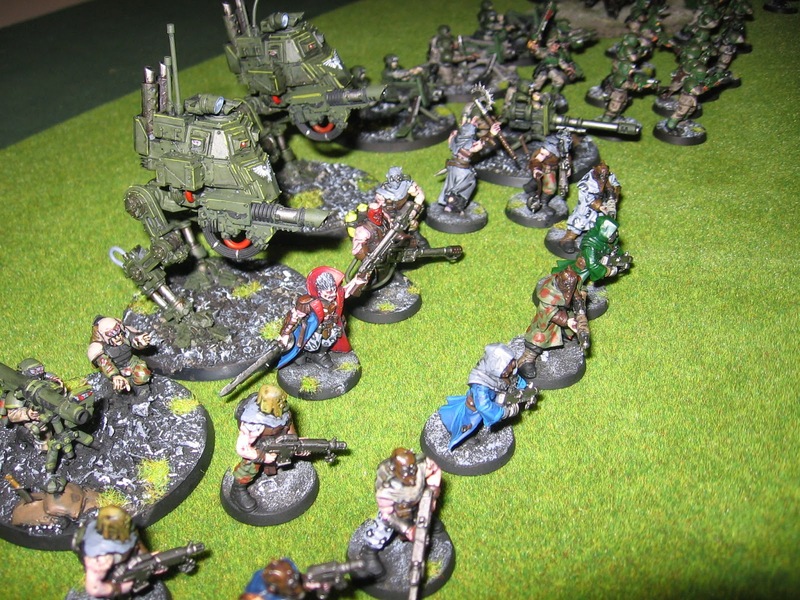 We don't play in the tournament scene, nor do we participate in the 'friendly' club 40K 'gaming scene. So we took a decision. 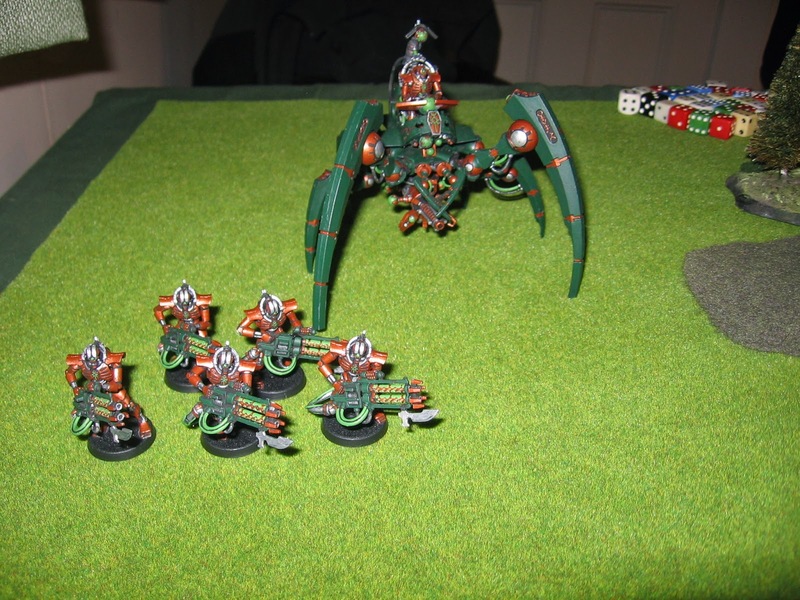 We would go back to 4th Edition Warhammer 40K, and the codices that we own. 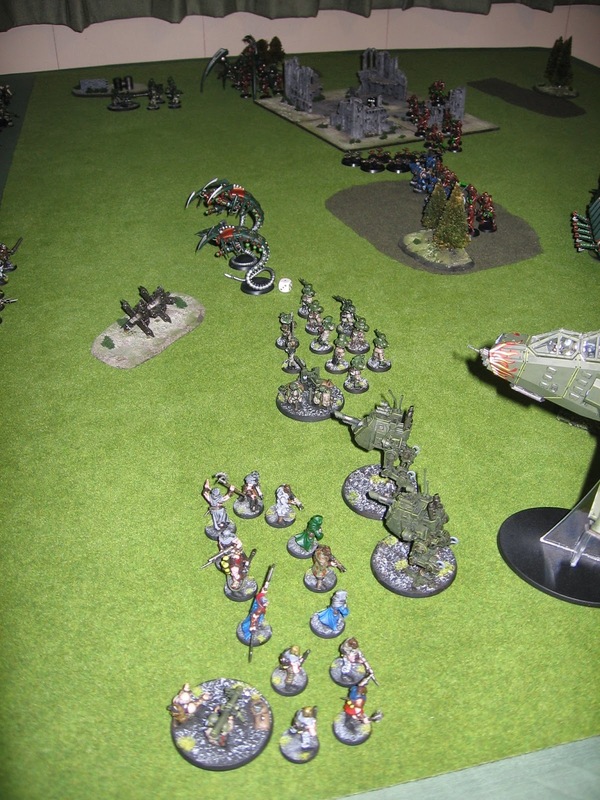 This week we went back to that 4th Edition and played our first game of 4th in a number of years. We have thoughts on some simple house rules that we think will make the game better and, since we don't play other opponents, who cares. This first reprise we simply played the rules as written as best we could remember them as we flitted through the rule book, and we'll now think about those house rules with a little more clarity. 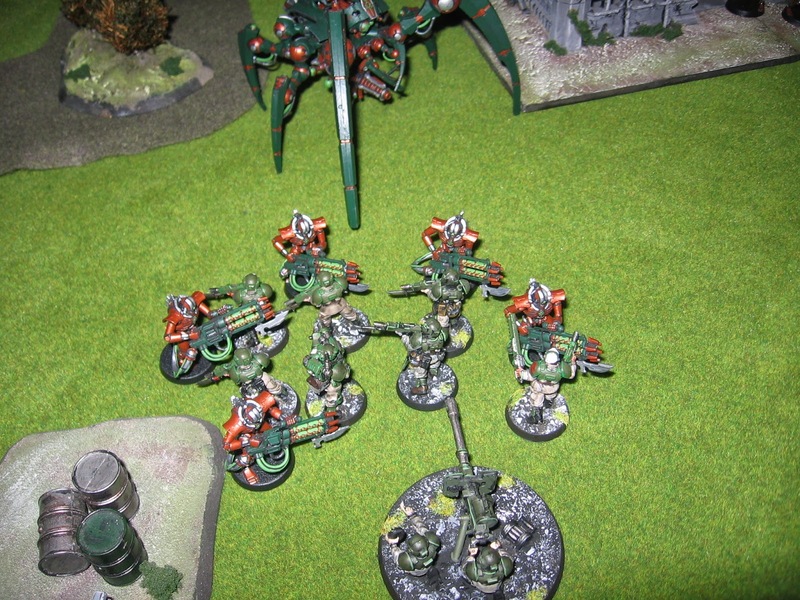 Adrian brought along his Necrons, and I cobbled together a Lost and the Damned list using the 'Eye of Terror' codex. 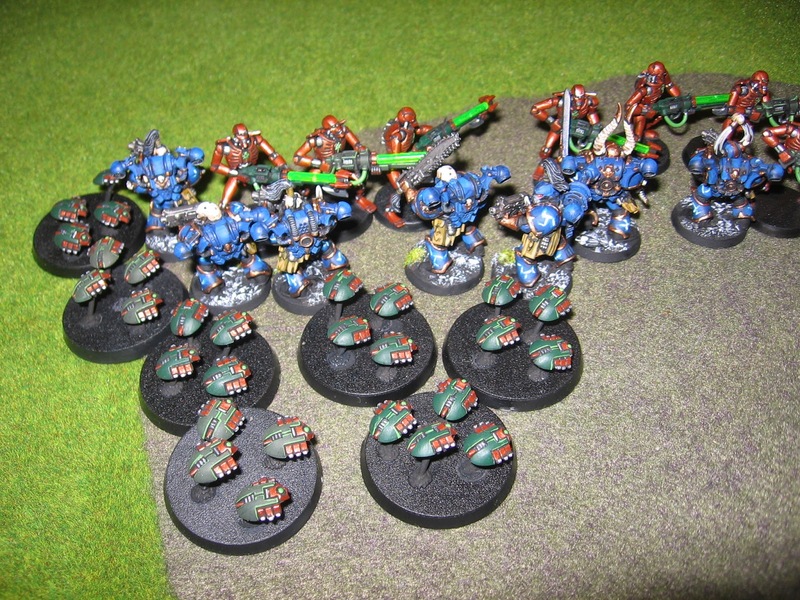 This was the concept that first attracted me to try my hand at the game in 2002 and with the acquisition of a lot of Imperial Guard material over the past few years I was finally able to field 1500 points. This would be the first game I'd played at that size. 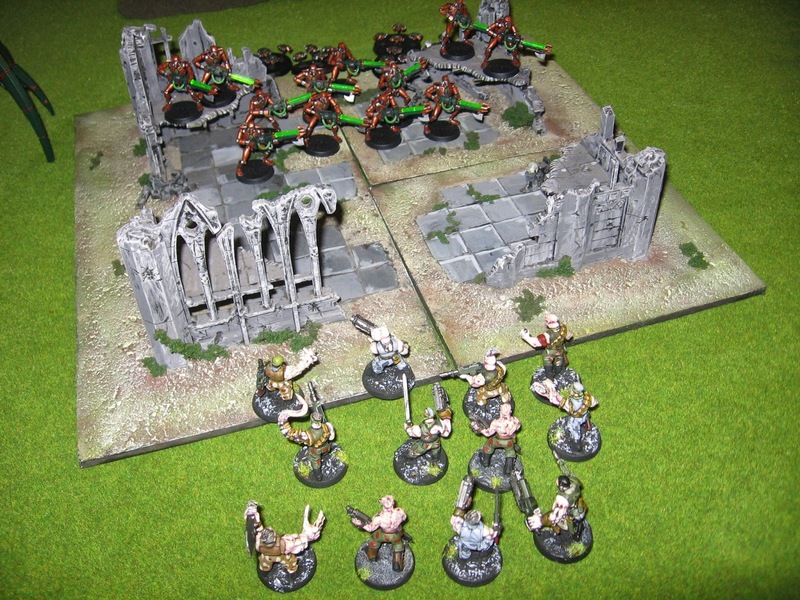 The Lost and the Damned army had at its core 4 units of Traitors, and one of Mutants, each of these were troops choices. In the spirit of the army concept I took a heavy weapon with each squad (although I remain convinced that this is NOT a game winning strategy). 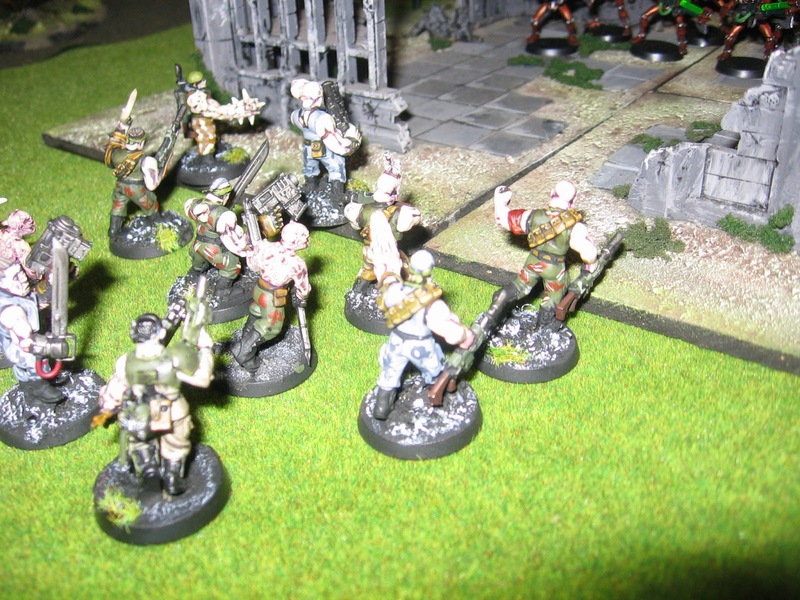 I also took a heavy weapons squad with heavy bolters, two traitor sentinels, and a Leman Russ. 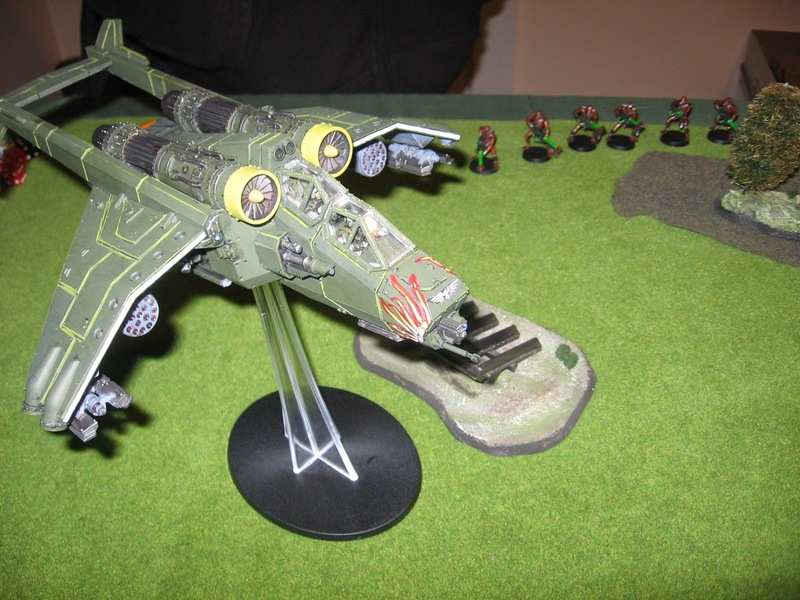 A Vendetta Gunship rounded out the selection of despicable traitorous vermin who had turned their backs on the Empire. 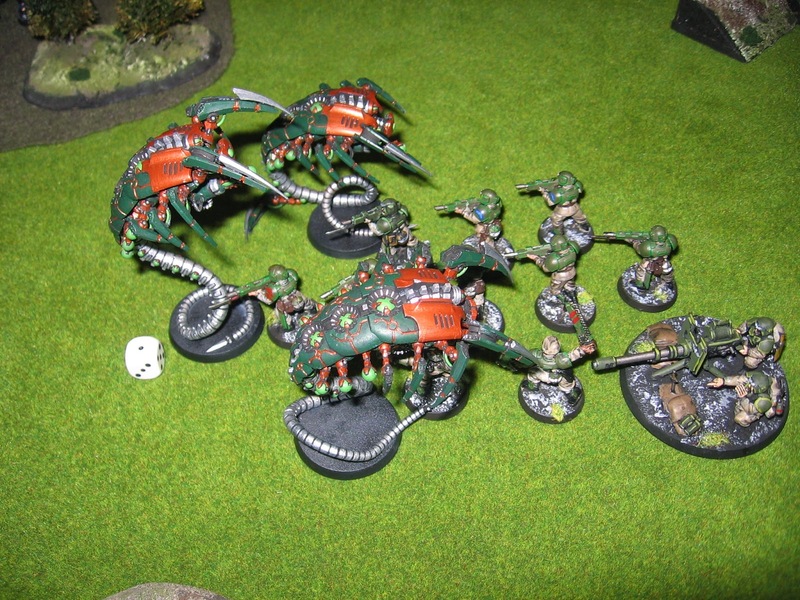 To finish the list there were some Chaos allies: a Dreadnought, and some Chaos space marines, all lead by an aspiring champion. 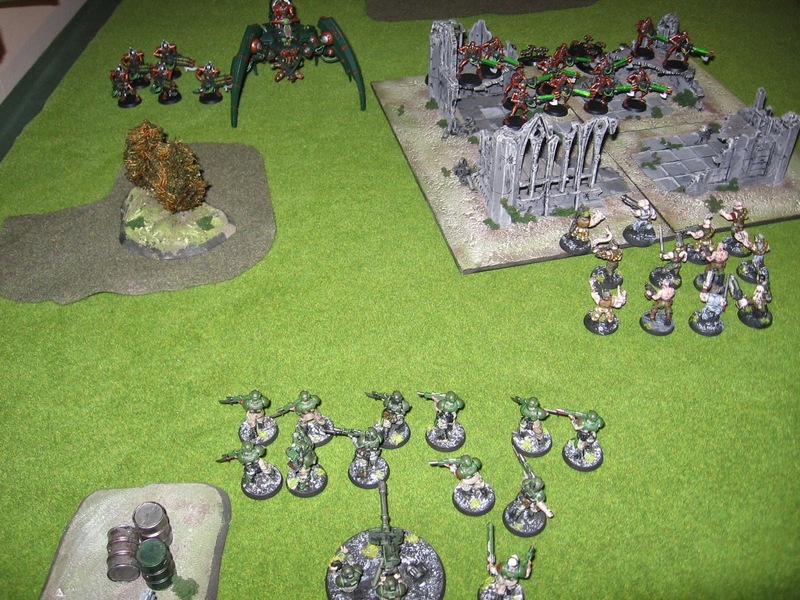 The table at the start, L&tD on the left, Necrons on the right. Adrian's flyer arrived from reserve and he deployed it on his left. Adrian leap frogged his scarabs (??) through his warriors so that my Mutants had no choice in the charge ... darn!! My right is solid .. The left?? Well.. honestly .... it seemed fine . And the Dreadnought finally succumbed to those.... THINGS!!! In one turn the Dreadnought and the Leman Russ disappeared.. ouch and damn!! 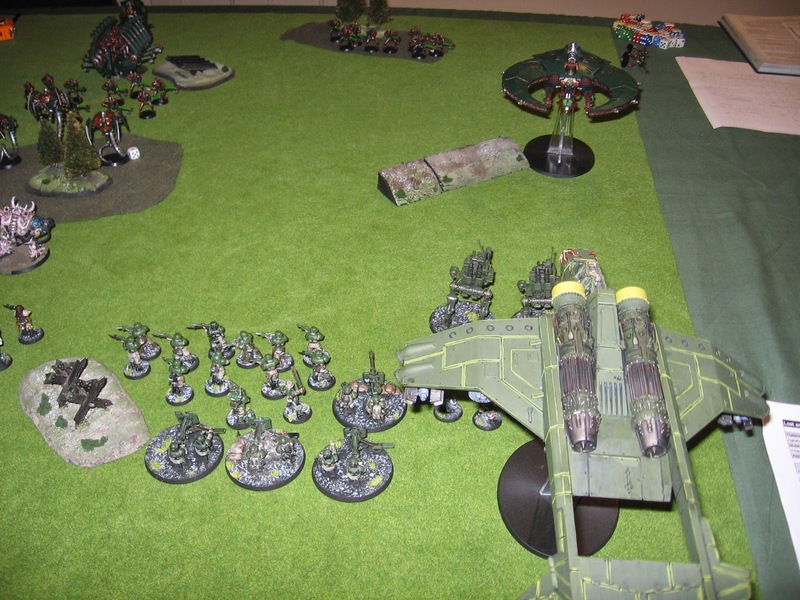 However the Vendetta and the sentinels disposed of the Monolith and the flyer.. The left was .. still holding ... wow!! 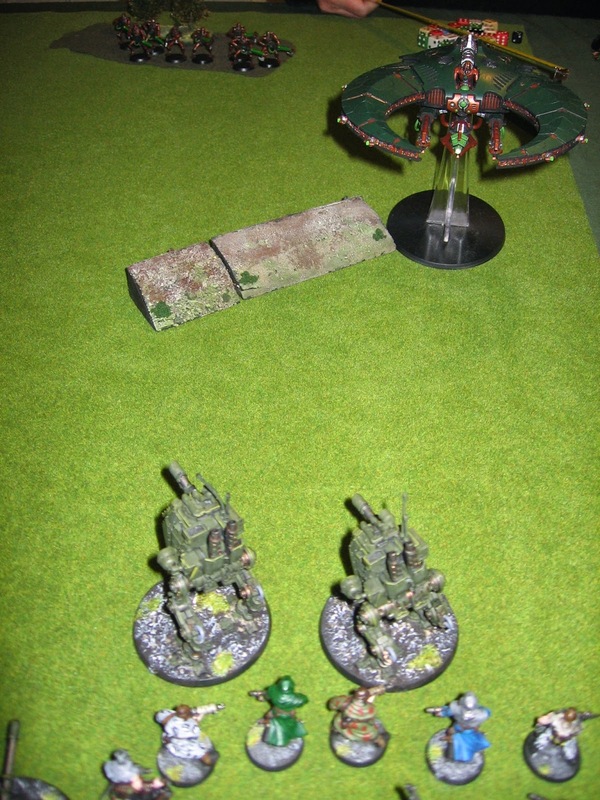 The Vendetta gunship swung round and disposed of another Necron vehicle (an ark??) 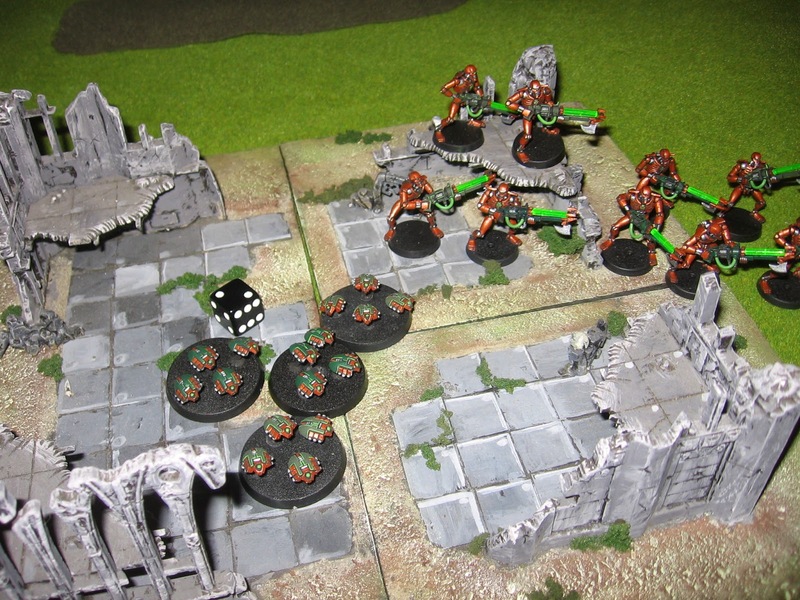 but was then brought down by some lucky shots from a Necron Warrior squad... thank goodness it was the 6th turn. It was simply a game, with gorgeous models and lots of dice, and it was fun. We'll play it a lot more, staying with 4th edition. It will be our own little time warp, and we'll be happy there, as the rest of the 40K world passes us by. 40K 4th edition.. 'back to the future '.